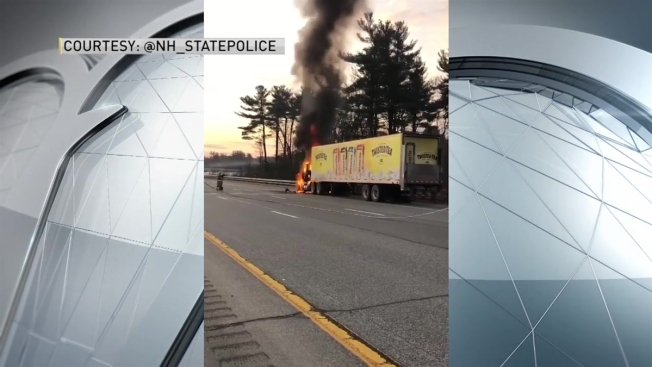 A tractor-trailer carrying Twisted Tea caught on fire while driving on Interstate 93 in New Hampshire on Thursday morning. State police said the big rig became disabled in the southbound lanes of I-93 around 7 a.m. Due to the incident, Exit 7 was closed for several hours and there were significant delays. Footage captured by state police showed flames and heavy smoke pouring from the front of the Twisted Tea truck. The blaze was doused within an hour and the driver, who was the sole occupant of the vehicle, exited the truck before the fire started. No one was injured, according to state police. The cause of the fire is under investigation.